The U.S. Navy has awarded Lockheed Martin (NYSE: LMT) a $1.38 billion contract to fund the procurement of long lead parts and components for the 12th batch of F-35 aircraft. 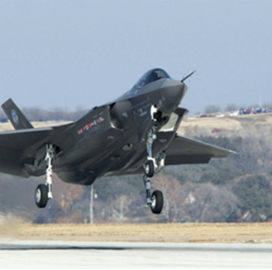 The Defense Department said Friday the materials are needed for the manufacture of 130 lot 12 F-35s in support of U.S Air Force, Marine Corps, Navy, non-DoD participants and foreign military sales customers. Lockheed will also use the funds to obtain parts necessary for the production of 110 lots 13 and 14 fighter jets for non-DoD participants and FMS clients, the department added. Work will occur in California, Florida, Maryland, New Hampshire, Texas, Japan and U.K. through December 2018. DoD noted the full obligated amount at the time of award is from fiscal 2017 aircraft procurement funds of the Air Force, Navy and Marine Corps as well as non-DoD participant and FMS funds.